A Pilgrim's Progress, this Norman Rockwell painting, appeared on the cover of Life Magazine published November 17, 1921. The alternate title for this illustration is Pilgrim Chased with Turkey. This was the twenty-third cover by Rockwell to appear on Life Magazine. A Rockwell painting only appeared one times on Life magazine's cover in 1921 and twenty-eight times in all. 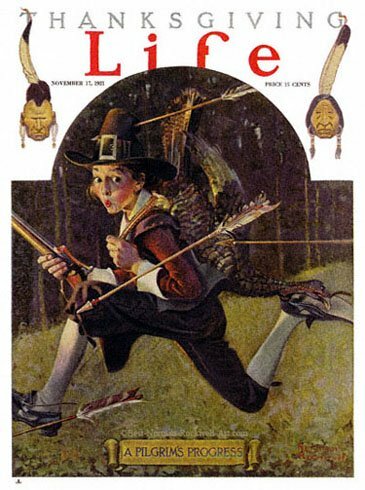 In this Thanksgiving issue of Life, Rockwell gives a humorous glimpse in the life of a Pilgrim boy. The Pilgrim boy is carrying a turkey and his rifle, presumably a musket. We do not actually know whether he killed the turkey himself or took it from someone else. He is running as fast as he can. Arrows are flying past as he runs. One arrow is even lodged in his hat. Are the arrow shooters trying to steal his turkey, or did he steal theirs? Or are they just upset because he was hunting with a gun and scared all the other game away? Either way he's going to be plenty hungry when he gets home. If he dodges all the arrows.